US Embassy Torched in Belgrade!... Charred Body Found! US Embassy Torched in Belgrade!… Charred Body Found! ** FOX News is live streaming the riots HERE. ** A charred body was found inside the US Embassy. FOX News is reporting that the body is that of a protester and not an embassy employee. 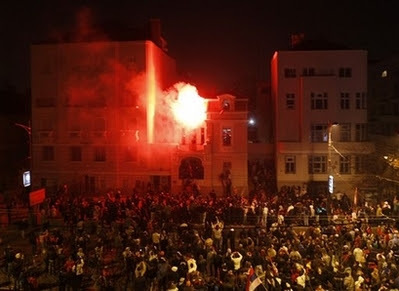 The Bosnian, Turkish and Croation embassies are also being attacked. 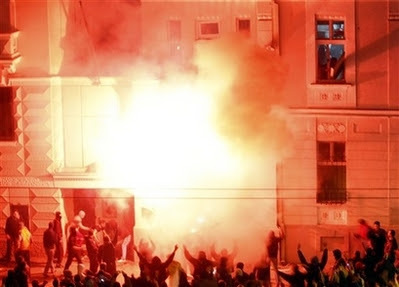 Several hundred protesters stormed the US Embassy in Belgrade today torching the building and raising the Serbian flag. Several hundred protesters have attacked and broken into the US embassy in the Serbian capital Belgrade, setting fire to part of it. The embassy was closed and unprotected at the time. Reports say the Croatian embassy was also attacked. The incidents came as at least 150,000 people rallied in protest at Kosovo’s declaration of independence. Protesters with flags and flares filled the main square. PM Vojislav Kostunica said Kosovo would always be Serbian. Earlier, on Serbia’s de facto border with Kosovo, Serb army reservists attacked Kosovan police with stones and set fire to tyres. Most Serbs consider Kosovo their religious and cultural heartland. US state department spokesman Sean McCormack said a number of Serbians had penetrated the embassy compound, and urged the authorities to take control of the situation. A blaze broke out in several rooms inside the compound. One protester is reported to have climbed onto the first floor and ripped the US flag from its pole. Riot police backed by armoured cars fired tear gas at the protesters. The incidents came towards the end of the main demonstration, outside the parliament.